I'm a city person: I feel total kinship with the poet Frank O'Hara when he says, "I can't even enjoy a blade of grass unless I know there's a subway handy, or a record store or some other sign that people do not totally regret life. "1 With the exception of occasional family visits to non-metropolitan areas, I generally prefer to limit my pastoral experiences to art and fragrances that evoke the great outdoors. 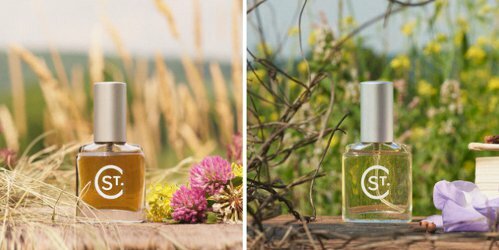 In that spirit, I've been sampling fragrances from St. Clair Scents, a new independent line based in Vermont's Champlain Valley. Its creator, Diane St. Clair, has a background as a maker of small-batch dairy products, including some very special butter that's distributed to upscale restaurants around New York and New England. (You can read about her farm here.) All three scents evoke appropriately rural settings. First Cut is an olfactory interpretation of the summer hay harvest — "a scent of the meadows, herbaceous and green, with wild flowers strewn throughout and splashed with radiant sunshine." The green top notes suggest grass and galbanum, bright and edgy. The fragrance slowly develops into something deeper, with a prominent hay note, plus notes that remind me of broom flower, honey and beeswax. The flowers arrive gradually, and they're honeyed too. I smell something similar to mimosa, and there's a hint of ripe citrus in there, too. First Cut dries down nicely into a sweet-ish musky skin scent. Gardener's Glove gets even closer to the earth, with "the background fragrance of the glove—tanned, aged leather, woods and soil—along with the ambrosial elements of the garden—sumptuous jasmines, roses, green blossoms and ripe fruit." It's a leathery floral, with a leather that's soft and smooth rather than animalic or dirtied-up. This fragrance feels a little different each time I wear it. Sometimes I notice more dark rose in the heart, and sometimes I get a dusky, plum-like fruit note. In any case, it's the most classical of the three scents, and my favorite of the trio. I wish it lasted longer on my skin, but it's a pleasure while it does last, and it feels right for this early-spring season. Third, we have Frost, a tribute to the poet Robert Frost. This composition was inspired by Frost’s poem "To Earthward," with notes of "clove and smoke; bitter woods and earth; sweet rose and rose geranium; sprays of honeysuckle and sparkling citrus." On my skin, Frost starts off with a cool herbal accord. I don't get much of the floral notes, but there's definitely a sharp tang of woodsmoke with hints of spice below it. Incidentally, all three St. Clair Scents fragrances are completely gender-neutral and seem to include heavy doses of botanical essences (versus synthetics). Just for the sake of comparison, St. Clair reminds me a little of indie lines like Sonoma Scent Studio and Dasein, but it has a distinctive New England sensibility. Overall, I enjoyed wearing these fragrances, especially as they settled on my skin and became part of me. I still won't be moving out to the country any time soon, but I can savor some private nature-inspired moments — with a dash of poetry — through these scents. St. Clair Scents First Cut, Gardener's Glove, and Frost are available for $65 each (13 ml) at the St. Clair Scents website. 1. "Meditations in an Emergency," from Meditations in an Emergency, 1957. I have a little paperback of “Lunch Poems” that I used to keep at work for reading during, yes, lunch. by the way, do you get any tomato leaf from the Gardener’s Glove? I’m glad we agree!! They’re complex yet wearable, and they really do smell “natural”—they must have a higher-than-usual amount of true botanical ingredients. And their personal, landscape-inspired feel did remind me of SSS and Dasein! Glad someone reliable has been extolling their virtues. I have been meaning to take the time to drop by and gush about First Cut. I don’t think I’ve ever drained a sample any faster in my life. I think my samples will be drained rather quickly as well! I really hope other folks will give these fragrances a test run….I really do feel this is a line well worth exploring, given all the mediocrity that is out there. Plus, it’s nice to support an upstart indie, right? First Cut is really unusual!! I like it a lot. I wonder if the opening of Fresh Cut is any similar to that of Hermes Gentiane Blanche, which reminds me of the white sap and bitter herbaciousness of a snapped dandelion stem. I find the Frank O’Hara to be rather haughty and pretentious, but the fragrances sound lovely, and a sample pack is on its way to me, so thank you! I love when sample packs are offered!! Right? Oh, that’s a good one! I’d never read it before. Thank you!